Republican vice presidential candidate Mike Pence is asking supporters to "pray for our country" ahead of the Nov. 8 election. The Indiana governor told an enthusiastic crowd in Exeter, New Hampshire, that the country's "trying times" call for people who are "inclined to bend the knee and bow the head." 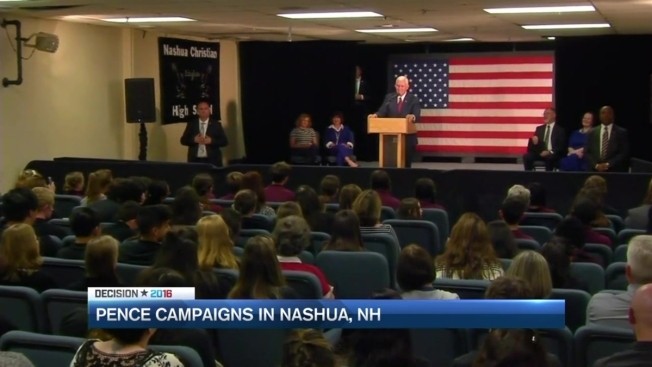 Pence says he's not advocating that anyone pray for any particular party, candidate or outcome - though he is urging supporters to "do everything in your power to bring New Hampshire home ... for the Trump-Pence team." Pence made five stops Friday in New Hampshire, a busier schedule that he usually has in any one state. The trip included a visit to a Republican Party campaign office in Nashua, where state Republican Chairwoman Jennifer Horn greeted him at the door. Horn was a harsh Trump critic before he won the state's first-in-the-nation primary in February. She later congratulated him on winning.